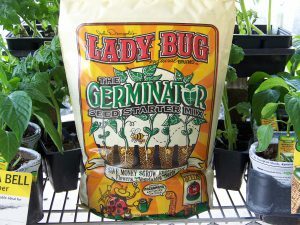 Home > Resources > Mumme's Moment > Lady Bug Garden Products – Organic at it's best. 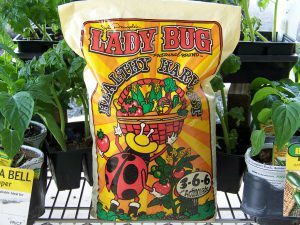 Lady Bug Garden Products – Organic at it's best. Lady Bug Garden products are available at your local Mumme’s Inc. These top of the line organic garden products are made from all-natural raw materials custom blended to create a unique line of organic gardening products. Lady Bug ensures that all of their products meet the highest quality standards by implementing the latest in agricultural research and composting technology. The Lady Bug Natural Brand products are not only premium but also personal. They believe in personal outreach for organic gardening enthusiasts all across the country. 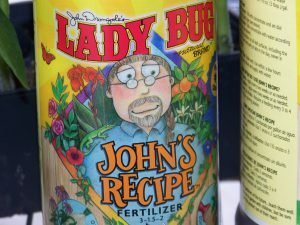 Grow organic with Lady Bug Natural Brand and Mumme’s Inc.
Mumme’s Inc is stock with a huge selection of Lady Bug garden products. If you want something we don’t have, we are happy to get it for you! 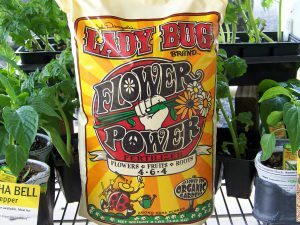 Lady Bug Natural Brand’s fully composted organic fertilizers feed the microbes in your soil and are beneficial for both your soil and your plants. This process of supporting soil health creates a natural, self-sustaining system that naturally helps to suppress insects and disease. This means less money and time spent fertilizing for you, and less chemical run-off for the environment. As local pioneers of the modern organic garden, we can offer you the absolute best fertilizer tailored to your gardening needs. We produce a variety of granulated and liquid fertilizers. Along with OMRI certifications, all of our fertilizers meet the National Organic Standards. Flower Power fertilizer is available at Mumme’s Inc. This fertilizer designed to give all plants a nutritious meal and a multi-vitamin at the same time. This all-natural fertilizer is made from aerobically composted turkey litter, hydrolyzed feather meal, and sulfate of potash. As the name implies, it is perfect for flowering plants, shrubs, and trees. The ingredients include Aerobically Composted Turkey Litter, Hydrolyzed Feather Meal, Sulfate of Potash, and Molasses. It’s a simple fact – rich, organic soils produce healthy plants! Gardeners who have ever labored over plants struggling in poor soils know the value of a good foundation. The proper ratio of soil, organic matter, minerals, micro-organisms and pore space is critical, whether gardening in native soil or in containers. 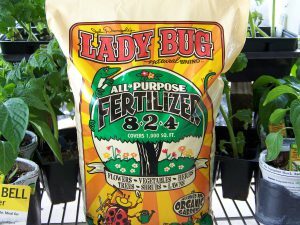 Lady Bug Natural Brand knows the difference between plain old dirt and rich productive soil. It’s the difference between a plant simply surviving – and thriving. With decades of experience along with laboratory testing behind our recipes, gardeners can trust Lady Bug Natural Brand to make their gardening experience a success. Healthy soil is the key to a healthy garden, and compost is the foundation of any good soil. Using the latest in composting technology and following the national standards for compost production, we work hard to make your gardening experience easier. Our composts are alive with beneficial microbes, strengthening the growing power of your soil. We have several composts to choose from, including a specialty blend and a few old-time favorites. Farm Style Compost is available at Mumme’s Inc and is straight from the dairy farm. Farm Style Compost contains 100% properly composted dairy manure with wood shavings to provide a fine-textured, high quality, and all-purpose compost. The ingredients include 100% Dairy Manure from happy grass fed cows. From growing healthy vegetables to stately trees, our native soils could use a little help! 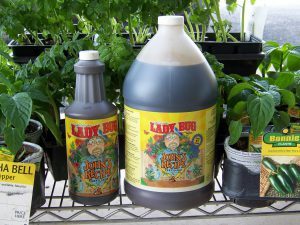 Lady Bug Natural Brand knows how to turn any soil type into a rich and healthy foundation for optimum growth of all plant life. A clay soil needs compost, Expanded Shale, and a liquid soil activator to improve permeability, drainage, aeration, and microbial activity. In a sandy soil, compost and soil activator can also help bind the loose texture of sand, and improve moisture and nutrient retention. Find all your Lady Bug garden products at Mumme’s Inc in Hondo, Pearsall and Rio Medina today! Stop by to speak with our garden experts on organic gardening and planting.